If you are using the Nestopia core and per-core settings in RetroArch, the config file is called nestopia_libretro.cfg. Exiting games when using RocketLauncher as “go-between” using controller. Works with BigBox version of LaunchBox as front-end. Does not seem to work when using the default LaunchBox desktop mode. Pressing “Esc” key still works from either. Update: It does work from LaunchBox. 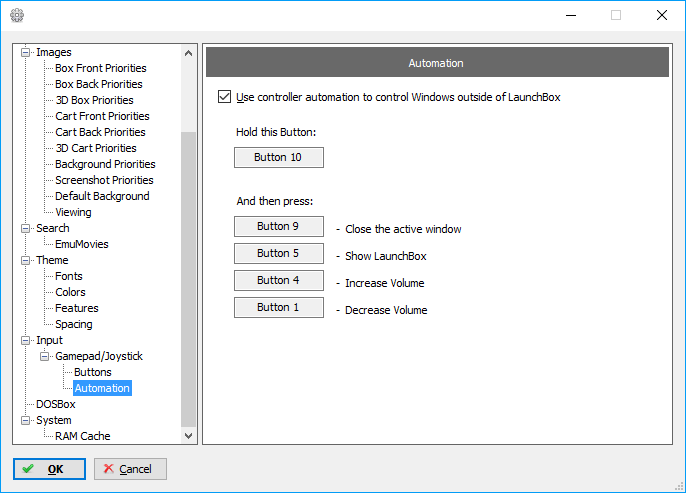 In LaunchBox, make sure you have the “use controller automation to control Windows outside of Launchbox” enabled. Then when you press down on the “Hold this button” selected button, and press the “Close the active window” button it will exit the emulator and RocketLauncher and return to BigBox. Using buttons 10 as initiation button and 9 as the action (close) button on my Xbox360/Xbone controllers means when I depress the left stick, hold it down, and while holding it down depress the right stick it will exit the emulator returning me to BigBox. Per-game/Per-core settings when using RocketLauncher and RetroArch. I’m a big fan of emulation on the PC of old(er) games; arcade, home systems, even older computer games. This will be organized by topic concerning some of the larger groups that either allow you to play the games (i.e. the hardware emulator) or allow you to play them more easily (i.e. front ends or collections). Generally speaking, you use a hardware emulator to run the game software for a specific system. If you only want to emulate arcade video games, you could use the hardware emulation built into MAME to run the software for each video game. If you want to run games on the Wii or GameCube you could use the Dolphin hardware emulator. The hardware emulator is like having the actual console or arcade inner workings on your computer. You still need the actual game to play ON the hardware emulator – a ROM for an arcade game, or one of the CDs/DVDs/cartridges from the home systems. Just like you plug in a cartridge into a Supre Nintendo (SNES), you load the game software into the SNES hardware emulator. If you want to emulate multiple hardware devices, it is convenient to have a front end. You choose the game you want to play, and it loads the correct hardware emulator and loads the software of the game into that hardware emulator. Finally, in between the hardware emulator and the front end there are some systems – I call them launchers – that add to the experience either by allowing the front end to be used by you more easily, or adding features such as pausing, passing commands to controllers (i.e. using an Xbox360 controller with your Dolphin emulator to simulate using a Wii controller), etc. I’ve added a separate page to keep these posts organized, rather than having to search through posts. Note that I will not attempt to duplicate some of the fantastic training and set-up videos by such stalwarts as Simply Austin or the LaunchBox team. My intent is initially to add tweaks/fixes for these systems and games that I’ve found so I don’t have to remember them each time. I’ve found that some challenges I have are more common than one might think, so I’m collecting them in this page. Madden 17. Xbox One. It happens every year. 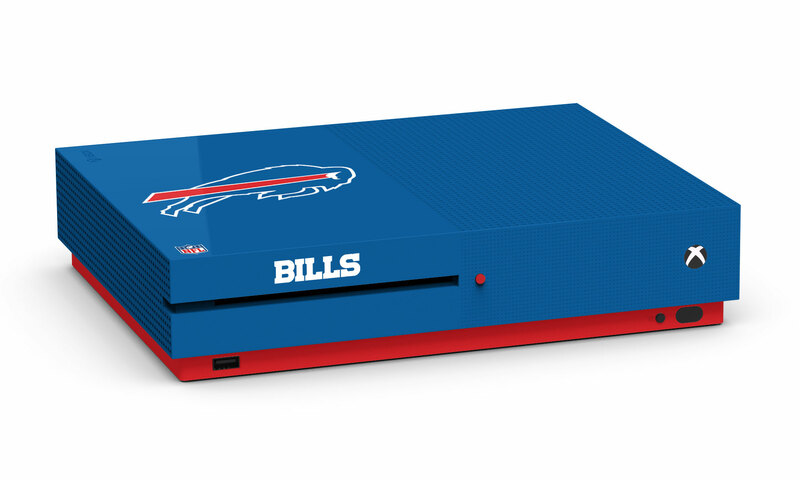 Microsoft has an Xbox One S Madden NFL 17 Custom Console sweepstakes that could win you one of these sweet systems. Or a Dolphins Xbone, but that would probably RROD within a few weeks. A “12”? Is that a Seattle fan with an inflated ego? I still don’t get how Texas A&M, even being paid for the use, is okay with that. And really, the Seahags don’t have anywhere close to the best or loudest fanbase. They have to cheat with acoustics in their stadium to sound loud. They’ve won a Super Bowl. But I guess when a team is basically the official team of the company providing the official display for play reviews (yep – the iPad) you don’t get to be just a 10.